This is outdoor living at its finest! Friends and family love to gather around the warm, bright glow. 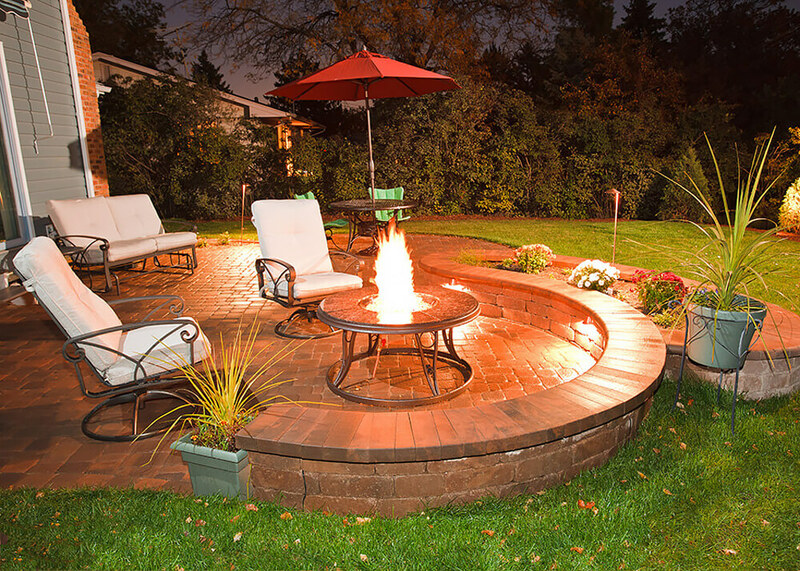 How much does an outdoor fireplace or firepit cost? This article will give you a good idea. 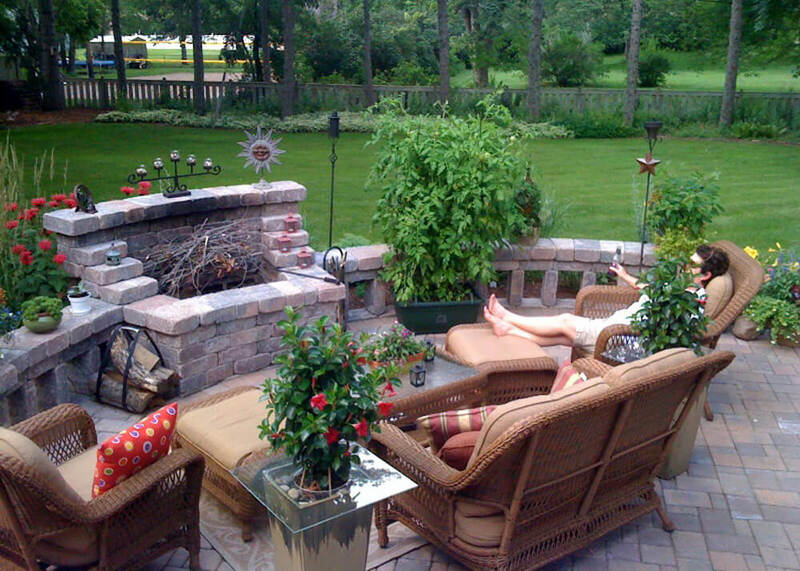 But first, why don’t you picture sitting outside on a cool evening in front of your Minneapolis outdoor fireplace, or firepit. This is outdoor living at its finest! Friends and family love to gather around the warm, bright glow. Solutions to Fit Any Budget! Whether you want to burn wood or have it run on gas, we can take care of it. And happily, there are solutions to fit any budget. 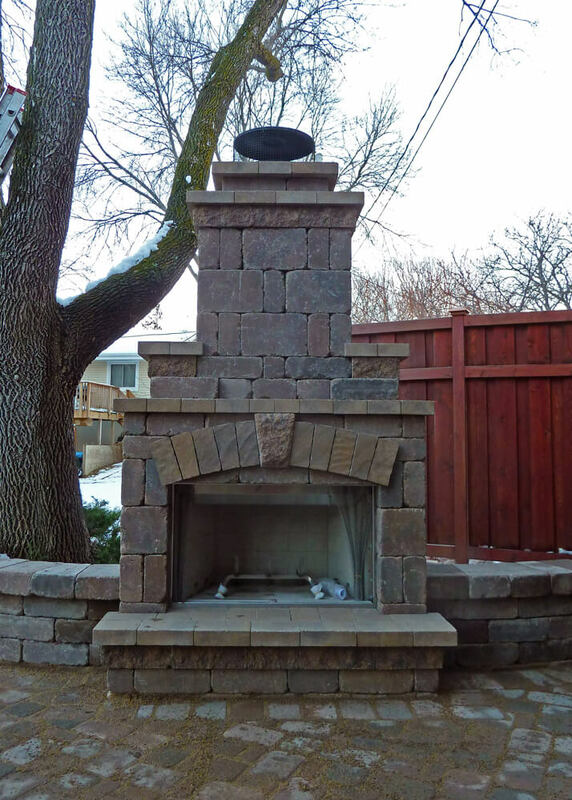 This article will help you understand the design considerations, legal code, and price levels for different types of Minneapolis outdoor fireplace and firepit installations. Let’s look at fireplaces first, then firepits below. Be sure to visit our Firepits & Fireplaces Project Gallery to see more photos. 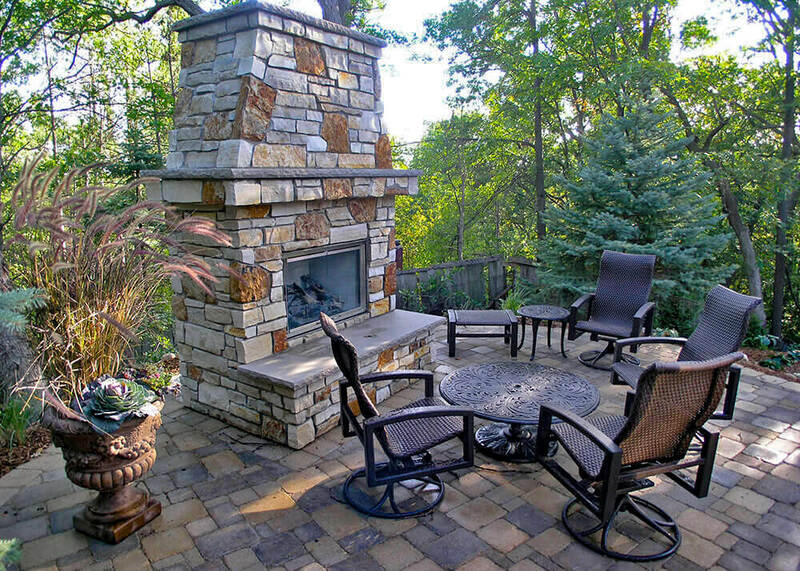 We’ve got several different ways we can approach a Minneapolis outdoor fireplace. At the left, you see a simpler one which we custom-build on site ourselves out of landscape block. Compacted aggregate base, the same as we put under patios and retaining walls, is adequate to support this fireplace. Code requires this type of “open burning” fireplace to be a minimum of 15-25 feet from your house, depending on the city. With the elevated burning area, and the potential for matching sitting walls, this is a very good setup for entertaining at a lower price than our other options. These start at around $1,800 installed and typically require no permits. Next is a pre-built, modular outdoor fireplace with proper chimney and “spark arrestor”. These come in many shapes, sizes, and colors to coordinate with your existing landscape or new patio. They can be veneered in block or natural stone. The two main benefits are the chimney, which allows it to be placed closer to your house than the open-burning style, and the modular construction which allows it to be installed on a compacted base instead of poured footings. Also, we can match the block on the fireplace to make sitting walls. 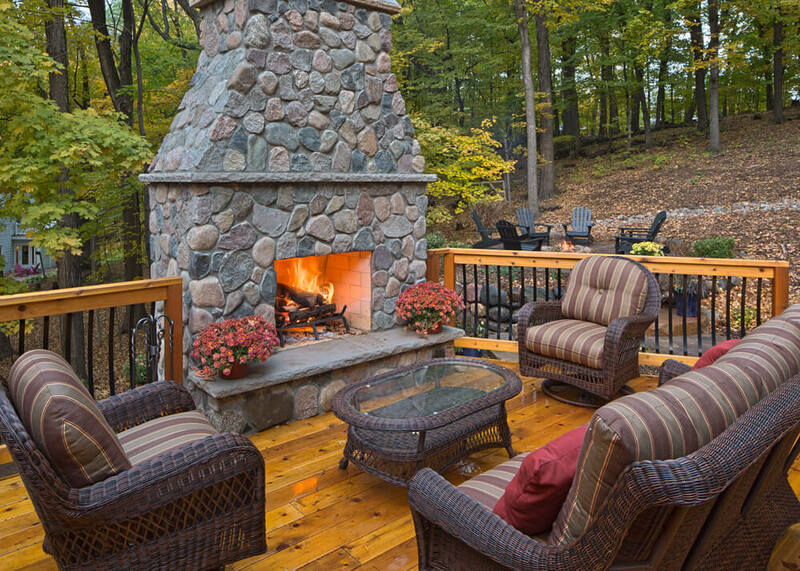 Many cities don’t require a permit for this type of outdoor fireplace, but some do. We’re used to handling the permit process so it isn’t a large concern for you. These start at around $7,000 installed, and can get over $10,000 for the really fancy ones. Figure an extra $2,000-3,000 to make it gas-burning. The base unit with the firebox weighs close to 4,000 pounds, so it takes our biggest Bobcat to move it into place! These are custom-built out of masonry block on minimum 4′ footings, which then gets veneered with the stone or brick of your choice. If you add matching masonry sitting walls, those will be built on footings too. The great thing about these outdoor fireplaces are they are infinitely customizable and can be built with any kind of veneer, including outdoor tile! Depending on the type of chimney, they can be placed fairly close to the house. These typically require a full permit process with inspections of the footings, any gas lines, and the final installation and hookup. These are beautiful, and naturally the most work and expense to install. Generally, the pricing starts at $10,000-11,000 and goes up from there. Figure again on $2,000-3,000 to make it gas-burning. These are the next simplest type of Minneapolis firepit. 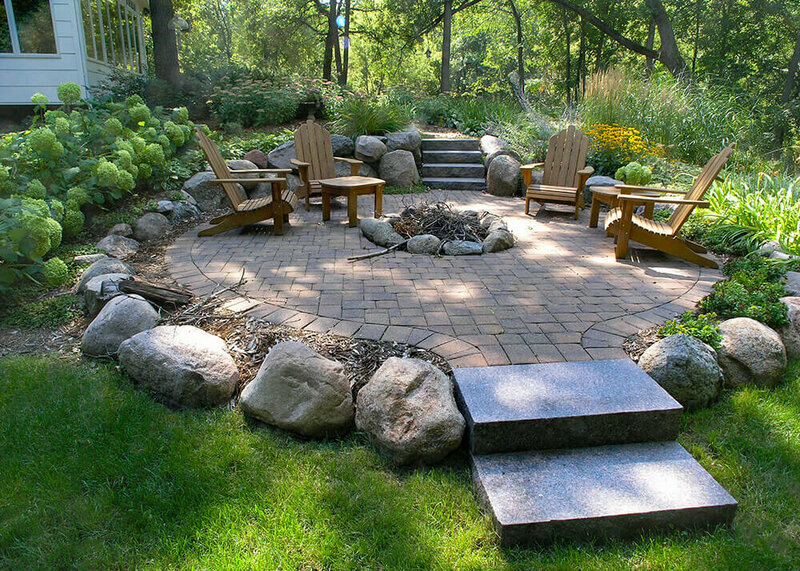 To install these, we simply cut a circle out of the patio, install some paver edging, and decoratively place boulders in the circle. 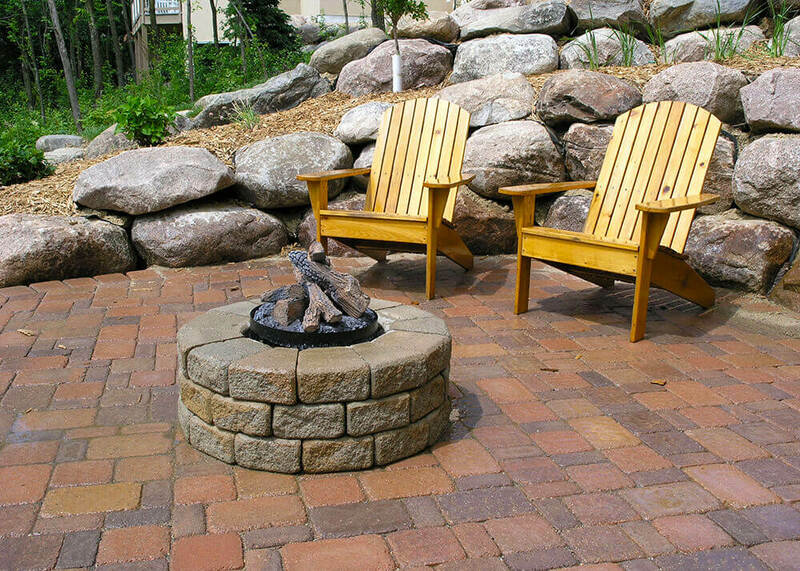 There are many different stone options (including natural wallstones) to use for this type of firepit, so the options are nearly limitless. Depending on the type of stone you choose, and how big we make it, these start at $350. Block firepits also come in many shapes and sizes, and there’s always an option which complements your patio.. We place these directly on top of your pavers. The nice thing is that if you were to decide down the road that you don’t want the firepit anymore, you can remove the block and you still have your pavers in place underneath and your patio is intact. We leave sand in the bottom of the firepit so the wood doesn’t char the pavers underneath. There’s also the option to have a gas fixture installed so you don’t have to deal with burning wood. It’s hard to tell, but that’s a gas firepit in the picture! Figure on $450 and up depending on the block and size. To run a gas line and install a gas fixture, figure on and extra $1,200 and up. There are also many attractive standalone gas firepit units. You can choose to put a block wall around them or leave them open, like this one. This one has a gorgeous granite surround, and also a granite lazy-susan which covers the flame area when you’re not using the fire. It is run on a gas line from the house, but some can be run off a propane tank. It can be a little hard to hide the tank, though! There’s nothing like sitting outside on your patio with family or friends, enjoying a roaring fire. Some of our favorite conversations from the last few years have happened around an outdoor fire. Please contact us if we can answer any questions about these, or if you’d like to set up a design consultation.